NEW for 2014, the Handy Home Products Meridian 8 ft. x 10 ft. Do-It-Yourself Wood Shed Kit re-imagines outdoor storage with slick, contemporary styling to match your home, and functionality to fuel your lifestyle. Stunning architectural detail begins with the generous, 6 in. deep roof overhangs and arched, gable vent. Perfect-sized, 56 in. wide x 6 ft. high double doors with full-length hinges, provide exceptional access from lawn tools to tractors and everything in between. An easy, open floor plan gives way to 530 cu. ft. storage capacity with 6 ft. 4 in. high side walls and an 9 ft. 2 in. high peak. With mega-tough, 2x4 wood construction, you can customize the interior any way you want. A premium, keyed locking T-handle is included for greater security. Add optional accessories to make it the perfect storage shed! This Do-It-Yourself wood shed kit can be easily assembled with a hammer, screwdriver, tape measure, level and stepladder. To purchase with floor, please see MFG Model # : 19348-4. Optional accessories shown sold separately. The Arrow Vinyl Dallas 10 feet x 8 feet steel storage building provides a long term solution for organized storage of your lawn & garden equipment, patio furniture and much more! The Dallas provides tremendous work space and offers great value as a home for common household and garden items. From greenhouse to storage, the Phoenix Solar Shed provides the ultimate project space. This building features a 6 ft. high eave wall, 9 ft. high peak and includes four aluminium roof, tempered glass windows. The shed can be painted and shingled to suit your decorative taste (paint and shingles sold separately). Building is shown with optional accessories. This 8 ft. Phoenix combination cedar bench is ideal for potting plants. Crafted from select tight-knot cedar, the slats can be attached side-by-side or spaced apart to allow for drainage and ventilation. All hardware and simple, illustrated instructions are included. 8 ft. x 10 ft. Meridian Shed NEW for 2014, the Handy Home Products Meridian 8 ft. x 10 ft. Do-It-Yourself Wood Shed Kit re-imagines outdoor storage with slick, contemporary styling to match your home, and functionality to fuel your lifestyle. Stunning architectural detail begins with the generous, 6 in. deep roof overhangs and arched, gable vent. Perfect-sized, 56 in. wide x 6 ft. high double doors with full-length hinges, provide exceptional access from lawn tools to tractors and everything in between. An easy, open floor plan gives way to 530 cu. ft. storage capacity with 6 ft. 4 in. high side walls and an 9 ft. 2 in. high peak. With mega-tough, 2x4 wood construction, you can customize the interior any way you want. A premium, keyed locking T-handle is included for greater security. Add optional accessories to make it the perfect storage shed! This Do-It-Yourself wood shed kit can be easily assembled with a hammer, screwdriver, tape measure, level and stepladder. To purchase with floor, please see MFG Model # : 19348-4. Optional accessories shown sold separately. 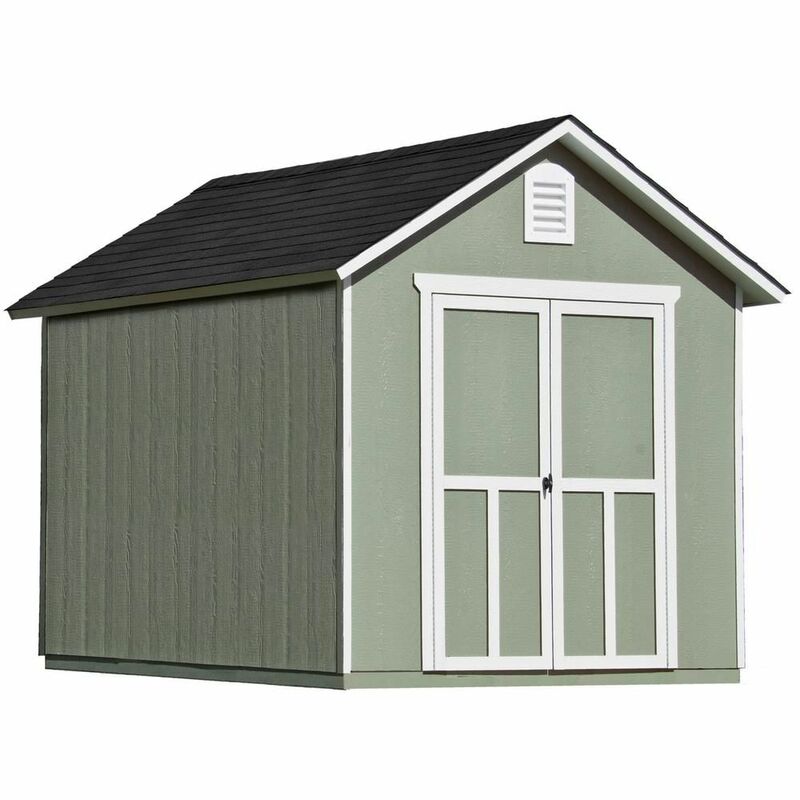 8 ft. x 10 ft. Meridian Shed is rated 4.7 out of 5 by 3. Rated 5 out of 5 by David from Fun to build and looks great. All the parts... Fun to build and looks great. All the parts were easily identified and instructions were very good. Rated 4 out of 5 by eieio from Storage shed The shed itself went together very well as all the pieces were pre-cut. There were three boards that had warped and I had to purchase them again from Home Depot, but was able to submit my receipt for reimbursement. I have purchased a &quot;Handy Home Products 8 ft. x 10 ft. Meridian Shed&quot; Model # 19347-7 and I have chosen a store pick up option. What is the total weight and the size of the kit? Would it fit for a regular open bed contractor's 1/2 ton pick-up truck? does the shed come with a floor, windows and shingles or do I have to buy these as extras? Flooring, windows and shingles are currently sold separately with this model.